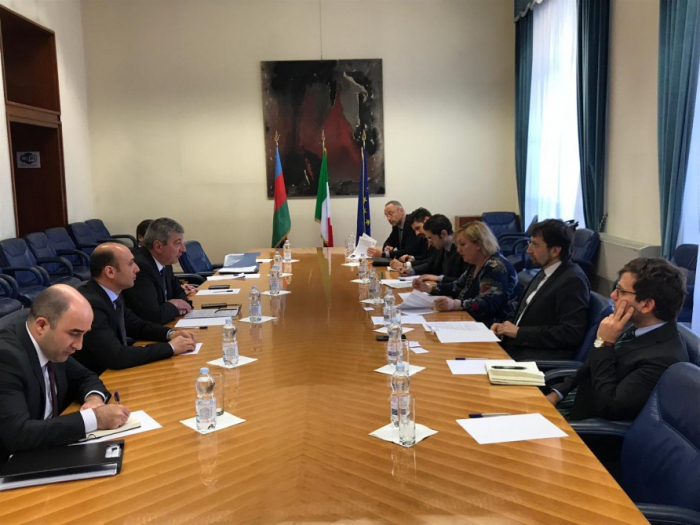 The ministries of foreign affairs of Azerbaijan and Italy have conducted political consultations as Deputy Foreign Minister Ramiz Hasanov visited Italy. He met with Italy's Minister of Foreign Affairs and International Cooperation Emanuela Del Re, Secretary General of the ministry Elisabetta Belloni and Diplomatic Adviser to the Italian President Emanuela D'Alessandro. The sides praised the relations between the two countries. They noted that President Ilham Aliyev's visit to Italy last year, President Sergio Mattarella's visit to Azerbaijan, as well as First Vice-President Mehriban Aliyeva’s visit to Italy contributed to the strengthening of strategic partnership between the two countries. Deputy FM Hasanov hailed the bilateral economic relations, noting that Italy is the largest trading partner of Azerbaijan. He also praised the successful activity of numerous Italian companies in various sectors of Azerbaijan`s economy. Hasanov also provided an insight into the cause and consequences of the Armenia-Azerbaijan, Nagorno-Karabakh conflict. They also exchanged views on Italy’s contributions to the Azerbaijan-EU cooperation, the new agreement, which will provide a legal framework for the strategic partnership between Azerbaijan and EU, as well as the other topics of mutual interest. Deputy FM Ramiz Hasanov also held meetings with President of the Foreign Affairs Committee of the Senate Vito Rosario Petrocelli and President of the Foreign Affairs Committee at Italian Chamber of Deputies Marta Grande. During the meetings, the sides hailed the interparliamentary cooperation between Azerbaijan and Italy. They underlined the importance of reciprocal visits of the parliamentary delegations and activity of the two countries` interparliamentary friendship groups.